Cardinal Cacciavillan, Nuncio to the US in the 1990s, reports rumors of McCarrick's sexual misconduct in 1994. (Washington) Another former Nuncio in the United States announced that in 1994 he heard rumors of sexual misconduct by Theodore McCarrick. However, that was still very vague then. Cardinal Agostino Cacciavillan is now 93 years old. In 1990, the former Vatican diplomat began his service as a Pro Nuncio in the United States, where he would remain until 1998. Yesterday, he told the Catholic News Service, the press agency of the American Bishops' Conference, that in 1994 they had received a phone call from a woman. That was several months before Pope John Paul II’s visit to the United States in 1995. "I remember receiving a phone call in 1994 while preparing for the Pope's visit to New York, Newark and Baltimore," said the cardinal. He was then in the Apostolic Nunciature in Washington. The woman said there would be a "media scandal" when "the pope comes to Newark." In Newark at that time McCarrick was archbishop. The reason given by the woman was "rumors about McCarrick's behavior with the seminarians." This was "no formal complaint", but "expression of a concern," according to the then nuncio. Nevertheless, the diplomat contacted the Archbishop of New York at the time, Cardinal John O'Connor: "Nobody knew better what happened in US diocese than the Archbishop of New York." Cardinal O'Connor promised an "investigation.” As a result, the nuncio was told that there were "no obstacles to the Pope's visit to Newark." Cardinal O'Connor, who passed away in 2000, is described by the Nuncio as "very competent", which is why he saw no reason to doubt the information provided by the investigation. But he never talked about these rumors with McCarrick, whom he met several times during his eight years in Washington. He also did not inform the Vatican after the feedback from Cardinal O'Connor. It was not until the beginning of October that he first spoke to a Vatican official about the matter, after Cardinal Marc Ouellet responded in an open letter to Nuncio Carlo Maria Viganò. Cardinal Cacciavillan denies having asked McCarrick to sell a house in Sea Girt, New Jersey, where he is said to have invited groups of seminarians to celebrate homosexual orgies. In any case, McCarrick sold the house in 1997, when Cacciavillan was still Nuncio to Washington. Cacciavillan is not mentioned by Archbishop Viganò in his dossier published on 26th August. In the dossier, he raises heavy charges against McCarrick, against Pope Francis and against a gay lobby in the Church. Since then, 65 days have passed, but Pope Francis has refused any response to the allegations and the associated request to resign. Msgr. Viganò, however, listed the steps of his immediate predecessors, the Nuncios Montalvo and Zambi, in McCarrick's case, as they had found expression in the nunciature records. The case was in late 2000 / early 2001 with the appointment of McCarrick as Archbishop of Washington and his move to the capital had led to him becoming really virulent, said Cardinal Cacciavillan. The question is what kind of "investigation" Cardinal O'Connor initiated in 1994, which produced no results. O'Connor was with McCarrick a few years earlier among the founders of the Papal Foundation Their cash flows to Rome could have played a not inconsiderable role in being "benevolent" both in the US and in Rome. Labels: Abuses, Cardinal Cacciavillan, Cardinal O'Connor, McCarrick, Politicizing Prelates, Washington D.C.
Edit: the abomination of desolation. This report comes from the German District of the SSPX. We learn how this “adoration” appears in practice from the Augustinian Church in Würzburg. There the Islamic Sufis dance at the beginning of Lent! The Augustinian Church looks like a museum or a gathering hall after its renovation, than a Church. 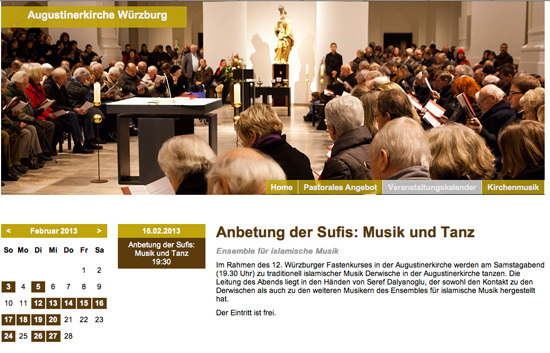 But as the “Dance of the Sufis” takes place, its formal desecration a church is complete. 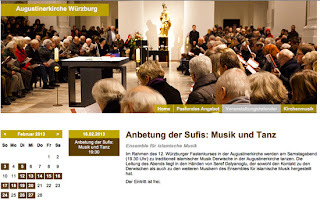 Why the Bishop of Würzburg is also “silent” here remains a mystery. 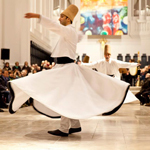 In the context of the 12th Würzburg Lenten Courses in the Augustinian Church, there will be traditional Islamic Dervishes dancing on Saturday (7:30). The course of the evening will be in the hands of Seref Dalyanoglu, who is also the representative for the Dervishes and other musicians of the Ensemble for Islamic Music. Worse still is a participant's obituary of the event. It had not only been a dance, “but much more a special form of prayer to God by the Sufis”. Edit: One of our friends sends us news that a parish in the Archdiocese of Chicago, which has a history of inviting "preachers from all over the country" and had invited a homosexual Anglican priestess to deliver the sermon. The event took place on 25 March, 2012. There's been no comment on it at all as far as we know. The parish is called Old St. Patrick's is to religion what going to Farrel's old tyme restaurant is to food. Except in the case of Farrel's, you're not going to get food poisoning or imbibe the pernicious doctrines of heretics. St. Patrick's is a suburban-like church with a Unitarian ambiance, complete with hip religious sensibilities of the aging youth cult, that is to say, the emphasis is on the here and now. Indeed, looks like they've slated an hour for confession on Good Friday. How generous! Here, at Old St. Patrick's, you can also give a welcome to a homosexual Anglican priestess. Each year during Lent, it has been our custom to invite distinguished preachers to share their reflections on the season with us. Whether through a Lenten Mission, Liturgy, or Evening of Reflection, Old St. Patrick’s has been proud to host some of the finest preachers throughout the city and country. For Lent 2012, Old St. Patrick’s continues this tradition. For the Sundays of Lent leading up to Palm Sunday, Old St. Patrick’s is honored to host an extraordinary opportunity to hear five outstanding, thought-provoking, and inspiring preachers. In the spirit of the Second Vatican Council, as we approach the 50th anniversary of its commencement, Old St. Patrick’s will honor the Roman Catholic Church’s commitment to ecumenism [sic], biblical scholarship, and social justice in the celebration of our Sunday Liturgy, as these five guest preachers break open the Word. In order to accommodate all members, visitors and guests who wish to witness this Series, we will host extended seating in the Church Hall with a live-feed from the Liturgy in the Church. Fifth Sunday of Lent March 25 11:15 a.m. Mass Rev. Bonnie Perry, D.Min. The Rev. Bonnie A. Perry is the rector of All Saints’ Episcopal Church, where she combines her passion for preaching and worship with her commitment to service and justice. In 1993, she and parishioners began distributing groceries to neighbors in need on the front steps of the church. By 2001, All Saints launched Ravenswood Community Services, a non-profit organization which provides hunger relief, health services, and life skills education in the Ravenswood and Uptown neighborhoods. These days, more than 400 neighbors make their way to All Saints’ for food, volunteer opportunities and community each week. But as one of three openly gay candidates who could be selected for the job Saturday--there are seven nominees in all--Perry, 44, stands at the edge of a global controversy threatening to split her church.Church leaders in Africa and South America have severed ties with the Anglican Communion since their American counterpart, the Episcopal Church, consecrated a gay bishop, New Hampshire's V. Gene Robinson, in 2003.